U.S. Attorney General Eric Holder at a press conference last month: "Other car companies should not repeat Toyota's mistake. A recall may damage a company's reputation, but deceiving your customers makes that damage far more lasting." TOKYO (Bloomberg) -- Recall first, ask questions later. After Toyota Motor Corp. and General Motors Co. were criticized for dragging their feet before calling back defective models in recent years, automakers are accelerating safety actions. Recalls recently climbed to record levels in Japan and China, while in the United States, the 2014 pace is well ahead of last year’s, when the tally rose to the highest since 2004. Toyota, roiled by a crisis over unintended acceleration in 2009 and 2010, on Wednesday issued its second-biggest recall announcement ever at a time when GM is facing condemnation for its handling of faulty ignition switches tied to at least 13 deaths. U.S. regulators are probing GM over the way it dealt with flaws it first saw as far back as 2001, a sign of intensifying scrutiny of safety practices in the auto industry. Regulators have drawn parallels between GM’s long-delayed actions and Toyota’s recall of 10 million vehicles for unintended acceleration more than four years ago. Toyota admitted last month as part of a settlement with the U.S. Justice Department that it had concealed information about those defects. Toyota recalled more than 6 million vehicles on Wednesday for five potential safety hazards. The problems involved almost 30 models and included cables that could prevent airbags from deploying and windshield-wiper motors that may break down and cause brake lamps to stop working. Some of the 6.4 million vehicles Toyota recalled are being called back for more than one fault, pushing the tally to 6.8 million. Several of Toyota’s top sellers -- such as its Camry and Corolla sedans and RAV4 sport utility vehicles -- were included in the recalls. Total recalls in the U.S. this year through Wednesday have already exceeded 12 million vehicles -- more than half of last year’s 22 million -- according to the U.S. National Highway Traffic Safety Administration data. Toyota surpassed 1 million recalled models in the U.S. this year even before the latest announcement, as had Nissan Motor Co. Honda Motor Co. is at about 900,000, and Chrysler Group, after an April 2 recall of SUVs, is about 738,000, according to the data. The latest Toyota recall included 2.3 million in North America, 1.77 million of which were in the U.S., according to the company. Last year’s U.S. recall tally was the most since 2004’s 30.8 million, according to NHTSA. In that year, GM recalled 10.7 million vehicles, including 3.7 million pickups for faulty tailgate support cables, according to the Center for Auto Safety. This year, GM has already recalled more vehicles -- 6.1 million -- than any other automaker did in the U.S. in all of 2013 or 2012. Toyota recalled the most U.S. vehicles in each of the last two years -- 5.3 million in 2013 and 5.3 million in 2012. Wednesday's recall by Toyota was smaller than the 7.43 million vehicles it called back in October 2012 to fix power-window switches. Ford Motor Co. called back more than 14 million vehicles in 2009 for a faulty cruise-control switch that could cause a fire, according to the U.S. Transportation Department’s website. Carmakers often take years to recall vehicles. Toyota said it first identified one of the five problems in the latest recall back in 2007. The one that came to light most recently emerged last year, it said. Toyota last month admitted wrongdoing and agreed to an independent monitor who will assess its safety reporting practices as part of a $1.2 billion settlement related to its handling of unintended-acceleration problems. 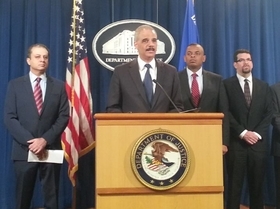 Attorney General Eric Holder said it was the largest criminal penalty ever imposed in the U.S. on an automaker. For Akio Toyoda, president of the company and grandson of its founder, persistent recalls are a setback to his efforts to restore the company’s once-sterling reputation for quality. He’s pledged to improve and speed up the company’s processes, forming a global quality group that he chairs. The automaker said previous decision-making related to safety was too dependent on executives in Japan and that it has given regional operations more autonomy to make fixes. Lawmakers last week brought up Toyota’s shortcomings during its unintended-acceleration crisis as they pressed GM CEO Mary Barra on the company’s handling of flawed ignition switches. GM now is being fined $7,000 a day for failing to fully answer NHTSA’s questions about the flawed part in cars including the Chevrolet Cobalt. Toyota and GM aren’t alone in facing challenges with cars in need of fixes. A surge in new models, increasingly complex technology and heightened regulatory scrutiny are behind the increase, according to a study released last month by financial advisory firm Stout Risius Ross Inc.
Automakers’ issues extend beyond the U.S. market. In Japan, auto recalls reached a record of almost 8 million vehicles in the fiscal year that ended March, the nation’s Transport Ministry said. They climbed to a record in China after the country introduced recall laws. The increasing use of standardized parts across vehicle lineups also raises the risk of larger recalls. Carmakers including Toyota also are pressing suppliers to make common components that they can put into various models. Toyota-affiliated supplier Denso Corp. for example, has developed air-conditioner units that it says go into small compacts and larger luxury cars. Volkswagen AG, Europe’s biggest automaker, uses standardized components such as electronic systems and axles as part of its plan to base Audi, Skoda and Seat vehicles on a common platform it calls MQB. In the recent Toyota recall, about 3.5 million of the vehicles -- more than half in North America -- were called back to replace spiral cables that may prevent driver’s-side airbags from deploying. Models involved include RAV4, Corolla, Yaris, Highlander, Tacoma and Camry that were produced from April 2004 to December 2010. Toyota is also recalling 2.3 million vehicles to inspect and, if needed, replace the front seat rails on three-door models. Toyota will also fix noisy and potentially unstable steering column brackets, replace windshield wiper motors and engine starters. Takaki Nakanishi, an analyst for Jefferies Group LLC, lauded Toyota for getting ahead of its problems. Toyoda, 57, has instituted a three-year freeze on new car plants to tilt the company’s priorities to quality and efficiency after its 2009-2010 recalls. Still, the latest recall was the second major safety-related campaign by Toyota this year. A global recall of 1.9 million Prius hybrids in February covered more than half of the models sold since it debuted 17 years ago. The company said it would update software to fix glitches that could cause the cars to lose power or shut down and stop. Recalls have done little damage to Toyota’s earnings. The company has forecast that profit for the year ending March 31 will surge to a record 1.9 trillion yen ($18.6 billion). Toyota also has set a target of selling an unprecedented 10.32 million vehicles in 2014 after leading GM and Volkswagen AG in global auto deliveries for a second straight year in 2013.